What if your musical instrument were gelatinous? Edible? 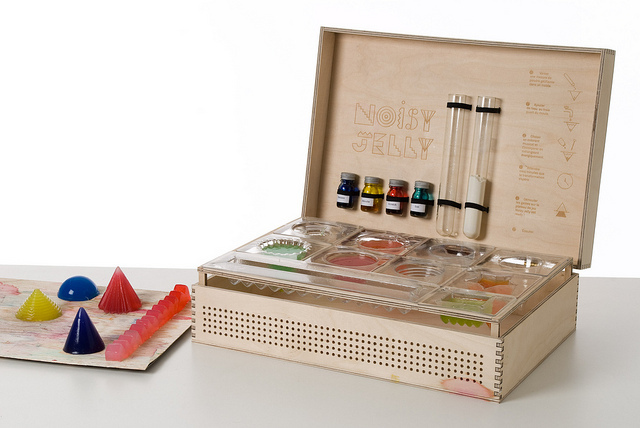 “Noisy Jelly” is the latest project to imagine that scenario. Thanks to the capacitive quality of gelatin (known to us Americans by the brand name JELL-O and to some simply as “jelly”), you can mix up a set of colored instruments that jiggle when you touch them. Powered by the open hardware platform Arduino to read sensors and Max/MSP to produce sound, it’s the work of a couple of Paris-based students, Raphaël and Marianne Cauvard. Check out the terrific video featuring wide-eyed children, and specs below. Noisy jelly is a game where the player has to cook and shape his own musical material, based on coloured jelly. If you do make your own project, we’d love to see it. Perhaps a gel-orchestra is next.